OMG! What a crazy two weeks it’s been! 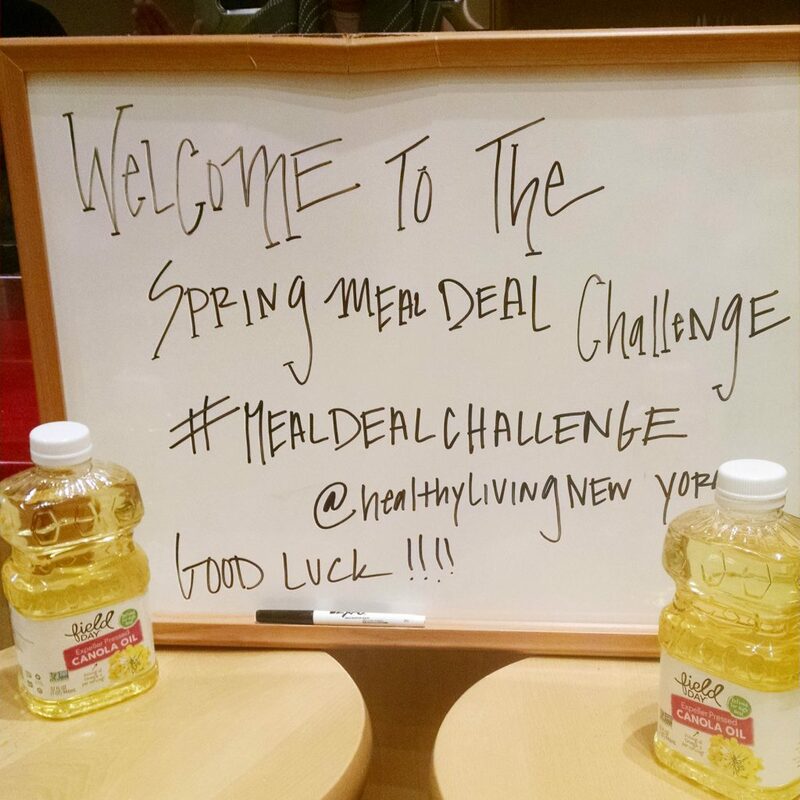 Two weeks ago, on a Monday evening, I got to participate in Healthy Living Market’s #MealDealChallenge with one of my favorite people, and kitchen buddy, Jen. If you follow Kimversations, you know that we have a blast in the kitchen and that I love her recipes. Me, with my partner in kitchen crime, Jen. I’ve been dying to post about how much fun we had but then MY SITE GOT HACKED!!!! I had to completely rebuild the site (which was fun – said no one ever) which delayed this awesome post. I’m also going to take this opportunity to apologize for any missing pictures or broken links as I am still trying to fix it all. Rant over . . . moving on. I’ve participated in Healthy Living Market’s challenges in the past. This challenge was a little different. Not only did we dash around the store, a la Guy’s Grocery Games, we headed straight to the market’s kitchen to prepare our meals. We were give 10 minutes to shop, a $25 budget and 45 minutes to cook. Our secret ingredients? A duck egg and apple cider. What the what??? We came in wayyyy under budget. We spent $20 and change. We got – chicken breast, kimchi, rice and curry from the bulk section (love the bulk section!!! ), green onion, ginger and soy sauce. Our meal could easily feed a family of four. There’s no way you could do that eating out. And did I mention that Healthy Living Market has reduced prices on many of their items? The big ticket items in our cart were, of course, the chicken and kimchi. But let me tell you this, kimchi goes a long way. It infused flavor into the rice AND it served double duty on our plate because we also included a little bit of it cold on our plate. Jen and I put our heads together and decided to make kimchi fried rice and curried chicken. We used the secret ingredients by incorporating the duck egg into the fried rice and by making a sauce with apple cider and grated ginger. 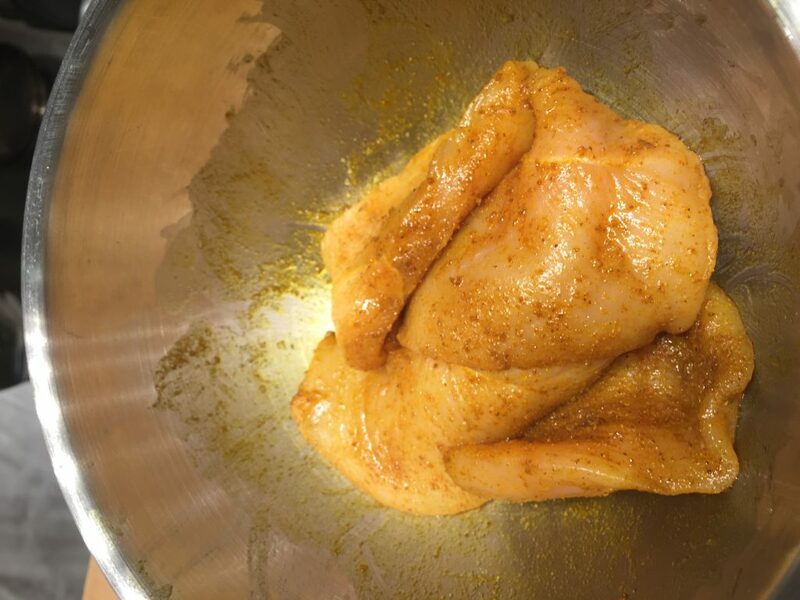 For the chicken, we seasoned the cutlets with a little ginger, salt and curry powder. One of things I LOVE about Healthy Living Market is their bulk section. You can buy as much – or as little – of a spice or herb that you need. 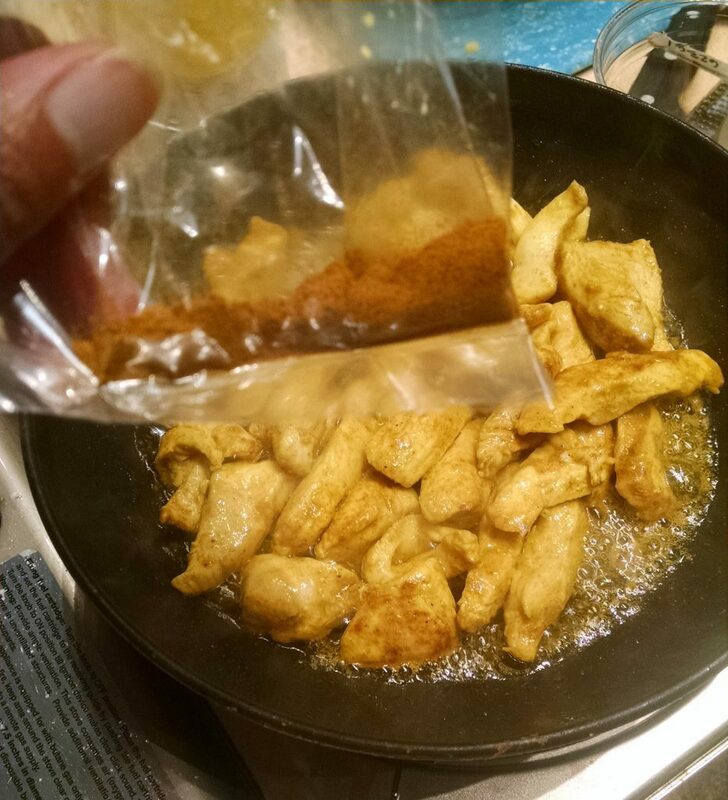 While the rice cooked, we seasoned the chicken with curry, salt and a little ginger. A little bit of curry goes a long way. With Healthy Living Market’s bulk section, we could buy just what we needed for our dish. Part of our #MealDealChallenge was using our ONE burner effectively. We had to make sure we completed our meal in the 45 minutes allotted AND was served hot. No small feat when making rice, reducing a sauce, frying the rice and sauteing chicken. The first thing we did was scramble our duck egg seasoned with a little soy sauce and set aside. Then we cooked our rice. The chicken absorbed the curry-ginger mixture while the rice was cooking. After the rice was cooked we made the fried rice which was simply adding the kimchi to a little oil in a skillet. We cooked for about 2-3 minutes, then added the cooked rice and chopped fried egg. 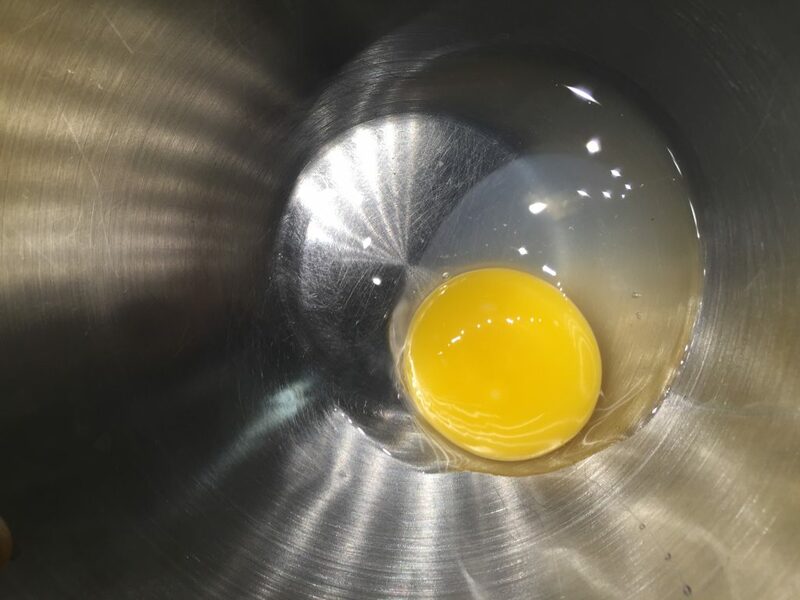 The Duck Egg! It was huge! We removed the skillet from the heat and covered it while we made the sauce – apple cider with grated ginger – reduced for about 10 minutes. Then we started to get nervous so we cut the chicken into smaller pieces and sauteed them. 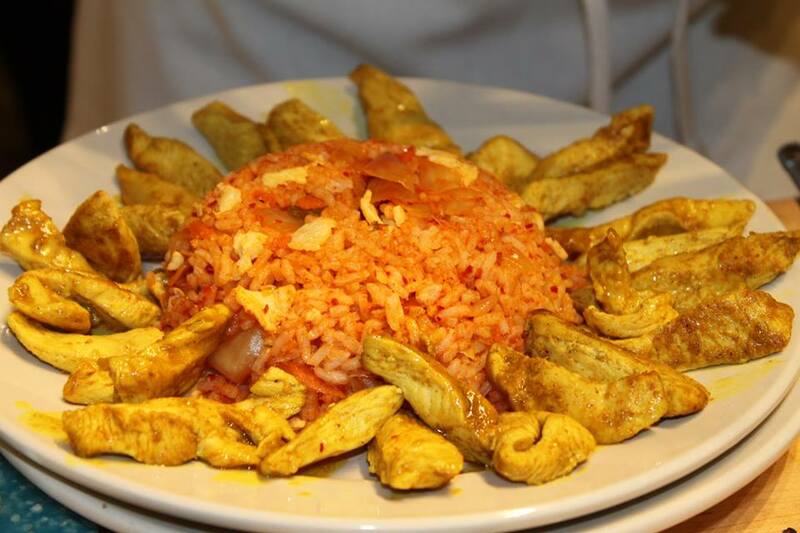 To server, we mounded the rice on a plate and placed the chicken around it. We added some cold kimchi to the plate and drizzled our sauce on the rice. It was really, really tasty and it took us about 35 minutes to make. Easy peasy. The finished product . . .
We didn’t win but that’s okay. We had a blast and got to see how our ‘competitors’ were able to maximize their $25 budget to come up with really creative dishes. The winning dish – steak au poivre served with hash and the duck egg . . . beautiful and delicious made by Ashley and Erica. You’d pay more than $25 for their winning dish for ONE PERSON at any restaurant. So stop in and visit Healthy Living Market Saratoga. You’ll be pleased with the quality and prices.